Isn't this a little cutie? That's a red-bellied woodpecker sitting on my glove as I took his photo. I don't know what possessed him to perch here. He didn't seem ill. Nor did he want to leave. He acted a bit "frozen" in the maybe-she's-a-predator kind of way. In any event, as I went to put more food out for the birds this afternoon, I suddenly had a woodpecker in my hand. They sure can grip with those super feet of theirs. I finally set the woodpecker in the feeder and went back inside. 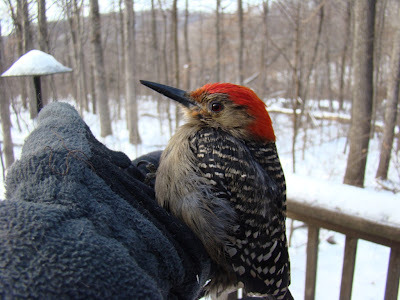 But for a few moments--well, it's not every day I have a woodpecker in my hand. 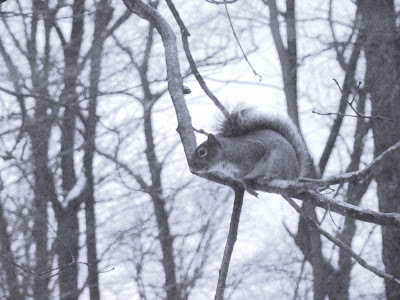 It’s a gray and overcast morning here on the mountain, so a photo of a gray squirrel seems appropriately monochromatic. This one is about to leap onto my bird feeders, scattering birds and seed in all directions. They’re such rascals. Despite it all, I enjoy their antics, even while I’m gritting my teeth. Here at my cabin, I am still iced in. My car is parked a ways down the mountain, not quite a quarter mile away. I have spread going on 50lbs of ice melt, salt, anti-skid and various other things over the glacier that is my driveway, to so far little positive effect. Here where I am, the trees prevent the sun from gaining much headway against the ice. Tree shadows fall across the driveway, moving as the sun traverses the sky, warming a spot only briefly before another tree shadow hits it. Since the temperature hasn’t yet gone above freezing, I am not getting any melting from the air temperature. It’s only where the sun’s rays can strike a spot for most of the day that I’ve seen any melting at all. None of those spots are in my driveway. Walking up to the cabin from the car isn’t something I mind overmuch. For most trips, the walk is enjoyable. It’s only when I’m lugging groceries or bags of dog food or something like that when it is difficult. Mostly, it is a pleasant coda to a day spent working in the city. 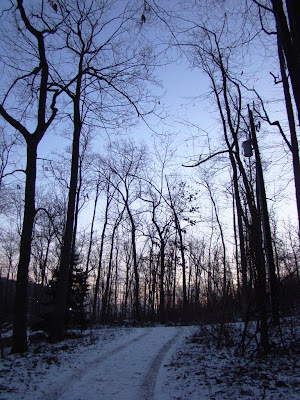 A walk up the mountain to the cabin is the time when those hours fall away, and I begin to reconnect with and again feel a part of the natural world around me. Yesterday brought yet another snow/sleet/ice/rain event to my cabin. 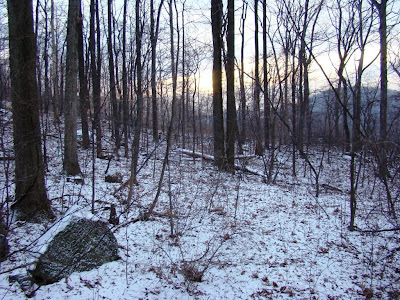 This one, for once, produced somewhat more snow than ice—until sunset, that is. Then a bit of rain fell, which instantly soaked into the snow and then immediately turned everything to ice when the temperature dropped below freezing. This morning, I don’t have a skating rink, I have a glacier. It’s that bad. When I’ve said in the past how much I like winter, I meant the old winters, when actual snow fell. 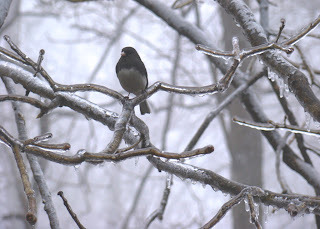 These new climate-change / global-warming winters that bring more ice than snow are for the birds. And I doubt they like this very much. 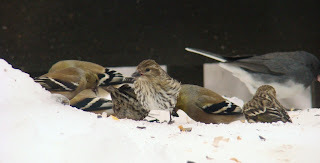 My feeders were busy during this latest precipitation event, and I saw more birds than I have all winter. Until yesterday, I never saw more than one goldfinch at a time at the feeders, and I suspected I was seeing the same goldfinch not multiple goldfinch that appeared one after the other. 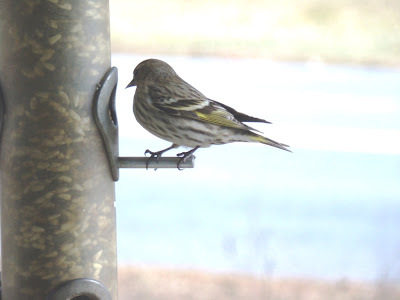 Yesterday, I had plenty of them, and with them came several pine siskins—the first of the season at my feeders. What I found most interesting is that the siskins and the goldfinch happily fed together at the feeders. Both species appeared to arrive and leave at once, as though they are all hanging out together when they are not at my feeders, too. I also observed that both are exactly the same size, at least to my eye. I don’t think I’ve seen them side by side like this before, so that wasn’t something I’d been able to observe before. The cabin is warm, and the dogs are sleeping. I'm at home doing some office work with one eye and watching the birds at my feeders with the other. Four inches of snow came first, then sleet, now freezing rain. Supposedly, this will change to just rain but up here on the mountain, I'm not holding my breath for that part. If I'm holding my breath for anything, it's that I don't lose electricity as the icing continues to worsen. Wasn't it just Monday when I was whining about not having any pine siskins to call my own? They're here now. Nothing like an ice storm to bring out all the residents. Between the squirrels, the siskins and a not-seen-before horde of goldfinch, it will soon be time to refill those feeders this morning. Stay warm! I'm going back into my burrow until this passes. Really, it’s still too dark for photos in the morning. But on a snowy morning like today, I couldn’t resist. I’m just appreciating the idea that it’s no longer middle-of-the-night dark when I leave the cabin in the mornings. I’m not the only one who’s pushing the morning’s light, either. This morning the feeder birds were already waiting for me to fill the feeders when I stepped outside. Even though it was still 90% dark and they shouldn’t have been up yet, juncos and titmice, cardinals and chickadees were stationed expectantly around the back deck when I appeared with the day’s food. I felt sorry for them so I gave them a second helping. It’s supposed to snow most of the day, and I think they were already warming up for their "feeding frenzy" mode. That’s why they were up early. They wanted to get an early start. Feeder birds are better weather forecasters than those who get paid big bucks to forecast the weather. The birds are telling me it’s going to snow today, and I believe them. That’s worth a second scoop of seed, if anything is. Their forecasts are always right. When you think about it, they work a lot cheaper, too. Lots of bird feeders in my region have pine siskins visiting (or hogging, depending on your point of view) their feeders. Mine isn’t one of them. Fortunately, my parents’ feeders do have them, so I was able to get a photo of one of them. These tiny finches are a bit nondescript, except for the pretty yellow bit on their wings. This year my own feeders are much frequented by the local birds, though I haven’t yet had even one unusual species. My feeders are on the back deck, which the current crop of sparrows don’t appreciate. I do see various sparrows on the ground but they haven’t come in to the feeders this year. Here are the species I’ve had so far. It’s not a very exciting list this year. That’s the way it goes. Even the non-exciting birds can eat lots of food, which they are happily doing. I use a variety of food at the feeders. Suet, mealy worms (which they love), sunflower seeds, safflower seeds, peanuts and a mix from Lyric called "Woodpecker" that everyone seems to enjoy, especially the non-woodpeckers. Snow is in the forecast for tomorrow and Wednesday so I’d better keep those feeders filled. I know they will empty quickly, if that happens. Yesterday was above freezing for the first time in several weeks here on the mountain. The day was also sunny and calm, so it felt quite balmy. As quickly as the thermometer climbed, my feeder birds disappeared. Oh, I had a few of them at the feeders, but the number and variety of them was way down. Snow still covers much of the mountain, though I can see a few bare patches in the open areas that get many hours of the day's weak sun and that aren't tree-covered. In those spots, I saw flocks of birds. Likely many of them were my own feeder birds, off collecting whatever natural food and grit they could find in the newly snow-free areas. On the colder days, the birds don't seem to travel far from my feeders. Even when they're not actually chowing down, they perch near the feeders, watching their neighbors eat. Flying around uses a lot of energy, and during winter, when food is not as easy to find, I often find they are less likely to fly off than during the summer. They seem content to stay near the food source and hoard their own activity so they don't use more than they take in. But yesterday (and today) the weather is warmer and the local birds are suddenly more willing and able to travel further than the trees directly above the feeders. This disappearance is a temporary one. In spring, when the birds can once again regularly find natural food, they will abandon the feeder. That's when I know it's time to take it down. But this time that will not happen, and the birds will be soon be back. The January thaw ends tomorrow. I've already gotten their food ready. 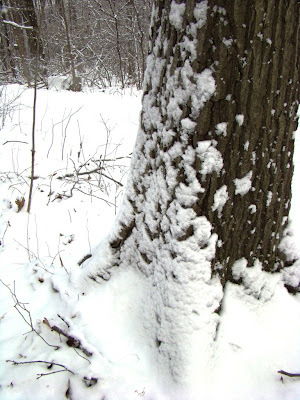 When I see a tree covered in snow, the way the base of this one is, to me it looks as though the tree is wearing clothes. The rounded branches of the tree trunk mysteriously growing into and flowing underground reminds me of the folds of the tutus often worn in Swan Lake. The pure white of the snow enhances that impression. If snow (or those swan tutus) were green, I likely wouldn’t imagne a connection. 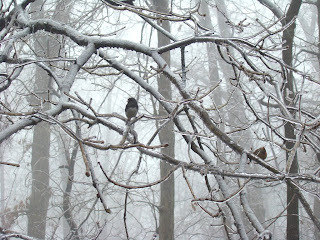 On a snowy afternoon, my front forest looks like a stage full of tall ballerinas, albeit a static view of them. Trees are graceful, too, but they don’t move nearly as much as ballerinas. The wind is their music and they will dance in any breeze, often in every bit as perfect a unison as those swan ballerinas do. The tree tutus don’t last very long, though. The snow fluffs off and disappears soon enough. They last for a few hours, perhaps a day and then disappear until the next snow when the dance begins again. Tomorrow the temperature might, just might, break the freezing mark for 24 hours. It will be above freezing by a few degrees, apparently, down in the city. Since my temperatures are usually cooler up on the mountain, the possibility of reaching that mark here is chancier. And yet, the idea of even a momentary January thaw is always something I look forward to. It’s not that I am aching for spring. It’s more that a brief thaw is like a little mini-vacation, sort of, at least in my mind. That’s a day when the heaviest coat can be left in the closet and the lighter one can be left unzipped, when the sun feels warmer. I think even the birds notice, as they are usually more active. It’s practically a lock that the cardinals will be singing. The day will just feel different, and that difference will be enjoyable. 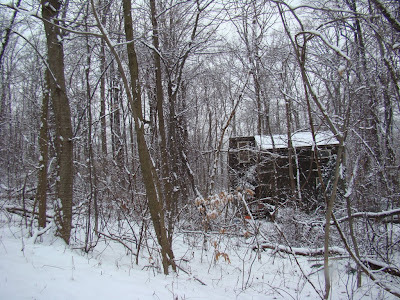 In winter the cabin is snuggled within the woods, almost hidden by trees. 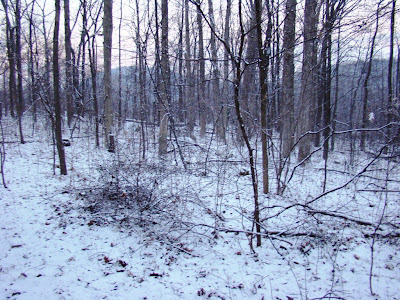 It is the color of the surrounding trees, covered with the same white snow. Your eye could almost pass across it and for an instant not notice it is there. A day of warmer weather seems to open life up again, to expand possibilities. Too often, in winter, I get in the habit of hunkering down or curling up, cocoon-like, when the weather turns much of daily life into an effort. Somehow, even a little warm-up rejuvenates me and lets me enjoy winter again when it returns the next day or the day after. Perhaps it’s simply the change itself I appreciate. In any event, I do appreciate it. We'll see what tomorrow brings. Snow has fallen here off and on all weekend. For most of the time, it didn’t amount to much. On Saturday it snowed all day, and all I ended up with was about half an inch. When it snowed on Monday afternoon, I didn’t think much about it. I was in the cabin, where I could see it snowing but I couldn’t really see the forest floor. So it was a surprise when I stepped out and found almost 3 inches of snow. Not much, certainly, but more than I expected after the ongoing and unproductive snow showers of the past few days. The local feeder birds had emptied the feeder an hour or so earlier and were huddled around, apparently waiting for me to fill them again. After the below zero temperatures of Friday night, Monday afternoon’s 20 degrees felt almost balmy. I filled up the bird feeders again and gathered up Dog and Baby Dog to go play in the snow. I don’t know what it is with my dogs. Perhaps all dogs are like this, but whenever I have snow, my two behave like crazy dogs. They run through the woods, noses under the snow. I keep expecting them to run into something and get hurt but so far that hasn’t happened. They really do have the attitude, though, that if it’s white out, they don’t have to listen. I put up with it as long as I could, then I took one of them inside. It’s easier to deal with wild dogs when there’s only one at a time. Despite the below average temperatures on the mountain this winter, snow has thus far been in short supply. I’ve missed it, for a variety of reasons. For one thing snow covers up a lot. I can leave things outside—watering cans, coolers, rakes, whatever—and when they are snow-covered it looks like so many interesting bumps. Without snow cover, it just looks like what it really is—stuff I haven’t put away. Snow lets me forget that part until spring. Or at least forget it for a Monday afternoon, which was good enough for the moment. Maybe I am more affected than I thought by the few hours of light during this part of winter. Perhaps I am relieved at surviving a cold night. Perhaps I am just easily amused. In any event, this morning I was inordinately thrilled to see almost see the sun above my horizon as I was leaving the cabin this morning. A few minutes out of my driveway I really did see the sun rising above the eastern hills. I think part of my happiness here is simply that I can now again take morning photos for Roundtop Ruminations. From late November to, well, now, I have to take photos during the weekends and dole them out during the next week’s posts. I really don’t like doing that. I like to see something in the mornings, take a photo of it and then post about what’s in that photo for the day. During these darker times, what I end up posting about on any given day may have nothing to do with the photo. Sometimes the photo feels like "old news" too. I might have a photo of the ice storm that melted away three days ago. I might have a photo of barren winter landscape when I have snow on the ground. I just don’t like that. Now, with the coming of the light again, I can at least begin to return to taking photos in the morning and then blogging about that. Yes, I know I’m pushing it a bit. After all, it’s really not all that light in the mornings right now, and on a cloudy morning I likely still won’t be able to take a photo. But this is a start. Happy Friday! On Monday morning sunrise will be yet another minute earlier than today. Overnight, a dusting of snow layered atop the last dusting. Dawn’s light arrives a bit earlier each day. Today is the first day it was light enough to take a morning photograph. At this hour, the light is still edged with night’s darkness, but the battle is lost and morning’s light predominates. 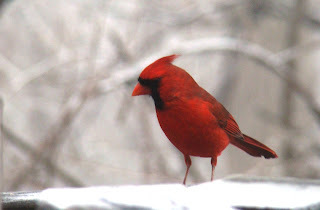 I awake to cold weather and a cardinal singing to the clearing sky. It doesn’t take much to make a cardinal happy. This time of year, I rarely hear them sing on a cloudy day, but if the skies are clear, it doesn’t matter to them that it’s mid-January. The cardinal is the earliest bird to arrive at my feeders. The sky is barely light when I first hear their "chip" call as I sit at the kitchen table. 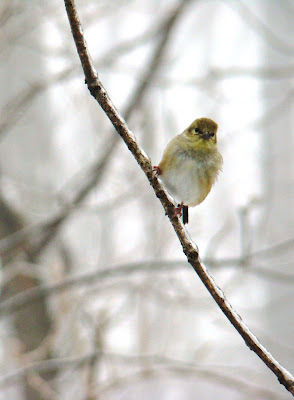 It will be minutes later before the rest of the crew arrives—juncos, titmice, chickadees, perhaps the Carolina wren. This morning I saw more residents of the mountain. Four deer—mom and the two kids, the fourth perhaps a young doe from the previous year. All are fat and fuzzy, almost long-haired in their winter coats. They graze on the small patch of grass they’ve uncovered at the bottom of my lane, calmly raising their heads but not moving as I drive past, almost close enough to reach out and scratch one’s ears. These deer are well used to people. This morning, Big Dad and his snowcat are grooming the slope next to where they graze. Someone else, Tim perhaps, runs a snowmobile up another slope, and a third snowboy is tooling around in his ‘Gator to check the snowjets. Through it all the deer are calm, barely interested. The grass is more important. The ice from the recent storms is much diminished around the mountain today, though some still lingers. The blast of arctic air that’s putting much of the country in the deep freeze is here at Roundtop, too. I will be happier when the wind diminishes. Nothing is moving much around the cabin right now. I haven’t even seen the deer that are usually out in the evenings. Everything and everyone is hunkered down, waiting out the cold. Some days it seems odd to me that here in the 21st century so much of my life revolves around weather in one way or another. Ice, snow, cold, wind—nothing I do is immune from touch of the natural world. I don’t see that in many other people. They really are immune from the severity of weather most of the time. I can tell by how they are dressed that they never really step outside. They couldn’t or they wouldn’t be wearing those wimpy shoes and fashionable coats. They walk from house to garage and then get in the car. Perhaps the only time they are outside is on the short walk from the car into the office. Sometimes I wish I were a little more insulated from these extremes myself. There’s always something that’s difficult to deal with or going wrong because of the weather. Although I think what I really long for, at least occasionally, is the protective little bubble of denial I see around me. People seem to feel that if they pretend the weather doesn’t affect how they go about their day, it won’t. But I’m just not like that. I could no more ignore the realities of weather than I could leave the house without an emergency kit in the car or ignore a sunrise. I suspect lots of people ignore the sunrise. They ignore everything else about the natural world. Maybe the weather isn’t so bad after all. My best guess is that this tree was "exploded" by ice. When I first saw it, I thought lightning destroyed it, but there’s no sign of burn marks. I haven’t had any lightning for months now, and I’m pretty sure I’ve been past this tree since the season’s last lightning storm. If you forced me to guess, I’d say it’s been no more than a month since I’ve been past this tree in my wanderings around the forest. The damage on this tree looks pretty fresh. The wood is pale and isn’t discolored the way I would expect it to be if the tree was damaged months ago. 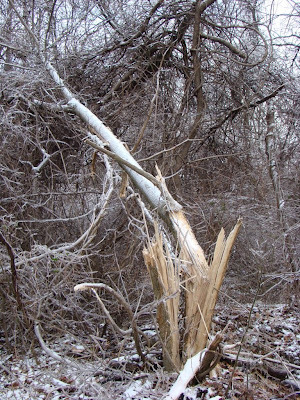 Since I believe the damage was caused recently, the only option I can come up that would damage a tree like this is ice. I’d be happy to hear other ideas. It is true that no other trees that I’ve seen show anything like this level of damage. I’ve seen some trees that fell over from the weight on the ice on them and lots and lots of downed branches, but nothing that looks like this. The tree isn’t near a road, not even a two-track road, so I can’t really imagine this is some kind of human-caused damage either. So, for the moment at least, that’s leaving me with ice as the damaging agent. And if this is ice damage, about all I can say is, wow! The poor tree is a goner, completely destroyed. It’s certainly an impressive level of destruction, too. It really makes me hope I don't have any more ice storms this year, that's for sure. The damage around the mountain is already bad enough without having to worry that more trees will end up looking like this. Does this look like 10 inches of snow to you? It doesn’t look like 10 inches of snow to me either. I should have listened to my instincts on this one. Friday night around 10:30 p.m. 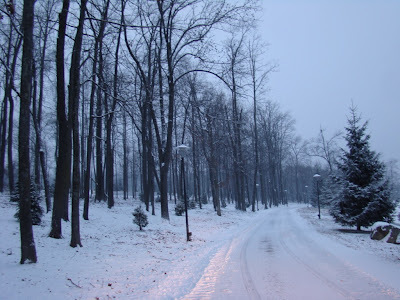 I was walking through the woods, back to the cabin, after working at the ski resort. The winter sky was clear and the nearly full moon was high overhead. The stars were out and twinkling brightly. It wasn’t even the kind of sky where high, thin cirrus clouds veil the moon and stars to some extent. None of that. It was perfectly clear. It sure didn’t look then as though I’d be seeing snow start to fall in just 6-7 hours. But, I told myself, it’s a "clipper" system. They move fast. Just because no clouds are here now doesn’t mean there won’t be any. And perhaps the forecast is off by a few hours about when this storm is to reach my doorstep. The next morning I awake to no snow and few clouds. The birds arrived at my feeders on schedule and ate the seed as usual—no feeding frenzy. If 10 inches of snow were about to arrive, I could expect to see that shark-like feeding frenzy the birds exhibit just ahead of bad weather. I didn’t see it. I did get some more ice, as you can see from this morning’s photo, though even that was barely enough to count. Ten inches of snow would equate to at least one inch of rain, and all the precipitation I got would amount to no more than a sprinkle. This forecast was way off, but I should have known better. This time my eagerness to see a reasonable amount of snow overrode what my instincts and observations were telling me. I should know better. Next time I won’t be fooled so easily. Last of the ice ...snow is on the way!! With only a little bit of luck, this will be the last of the ice photos that I will post for a while. Tomorrow snow is on the way, perhaps as much as 10 inches! Assuming for once that the forecast is right, I’ll finally be able to do a bit of skiing, perhaps some snowshoeing. I will be having fun in the snow! Finally! But that’s tomorrow, and today I’m still dealing with the ice. My conifer trees are as stiff as a board. I touched one last evening and it literally broke apart in my hands. So, I’m trying not to touch anything as I go in and out of the cabin. Funny, but I never thought of living in the forest as like walking through a china shop before. I think the lane past the cabin is now free enough of ice that I could get the car up the hill, but because the trees are so brittle and fragile, I’m still walking. Perhaps things will melt more today before the snow arrives tomorrow. I hope so. I suspect that 10 inches of snow atop trees already laden with ice would not be a good thing, either for the trees or for my electricity. The recent weather is taking a toll on my budget. The birds that come to my feeders are eating a lot of food. They can’t do much, if any, foraging with everything so encased in ice. So they come to my feeders and spend the day. I am going through about 25 lbs of seed every 8-9 days. I use a 20 lb. bag with added sunflower, safflower and niger seeds. Then I add in some mealy worms. Plus, there’s suet. The other day I saw 3 different woodpeckers—downy, hairy and red-bellied—plus a nuthatch within a few feet of each other. If I accidentally let a feeder go empty, the woodpeckers are pounding on the cabin. To me it’s as though they are telling me it’s time to fill their feeders. I know that’s likely not the case, but that’s sure how it seems. Did I say I had ice? I think I may have mentioned it. 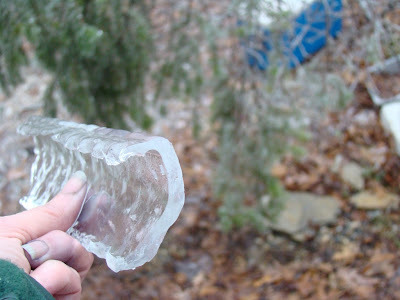 I wanted to show just how thick this ice was. The first photo is a piece of ice I pulled off the roof rack of my car. It’s a bit more than 3/8 inch thick but not quite .5 inch. 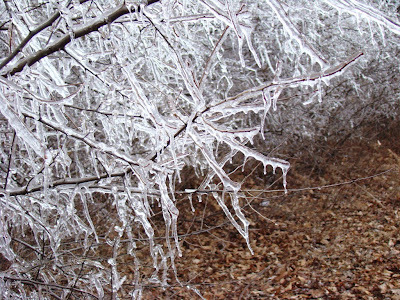 This morning the trees are still covered with ice, some bent double, some broken, I think. At this point, I don’t know the full extent of the damage. The cabin is safe and warm, though. I parked my car down in one of Roundtop’s lots shortly after the storm began, so I am now walking about .25 mile to the car, lugging the computer and purse with me. 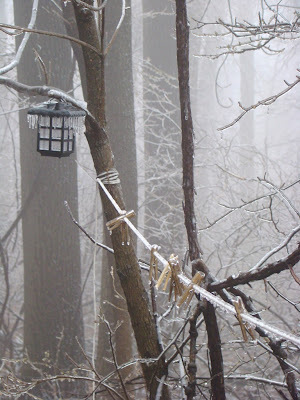 Today, maybe, it will warm up enough for at least some of the ice to come off the trees. Perhaps I’ll be able to park at the cabin again by Friday. 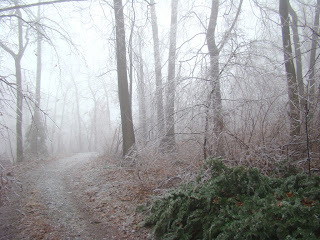 I also had fog with the ice yesterday, which created something like a whiteout, or perhaps merely a grayout. In any eve nt, I couldn’t see much. The weather this winter has been rather odd. Basically, it’s been normally cold, with temperatures down into the teens and single digits, but then about once a week it warms up to 33 degrees within 12 hours and I get an ice storm. Then the temperature drops back down to the teens again, often within another 12 hours. Many of these ice storms are storm systems that come up from the south, riding up the eastern coast, bringing warmer southern temperatures with them while the storm is overhead. So far this winter I’ve had almost no snow, certainly I’ve not had a decent snow. It’s been an inch here or an inch there, though mostly it’s been ice. I’m tired of the ice. I can’t snowshoe. I can’t cross-country ski. Maybe I should just take up ice skating. Coming down off the mountain this morning, the roads weren't too bad, though I saw several places where ice-laden trees and branches balanced precariously on the utility wires. Once off the mountain not only was there no ice but the roads were even dry. Somehow, seeing no ice and dry roads makes me feel a little shell-shocked. Off the mountain, it really is a different world. I've got ice. Lots and lots and lots of ice. I'll have photos tomorrow. Dial-up and photos aren't a good combination. Suffice it to say for today that if I've ever had a worse ice storm, as far as the amount of ice, I don't know when it was. I measured the ice on my car, once I got to the point where I could start to remove some of it. It's 3/8 of an inch thick. I needed a blow torch to get through that ice. So far, I still (cross fingers) have power, though with wind supposed to start before the ice melts, that may not last. In fact, I don't really expect it to. The first time I ventured outside, I wasn't even off the deck when I hear a crack and expected to hear a tree fall. It wasn't a tree. It was a transformer. It stank for minutes afterward. I think something got in there looking for shelter and got zapped. It's been that kind of day. 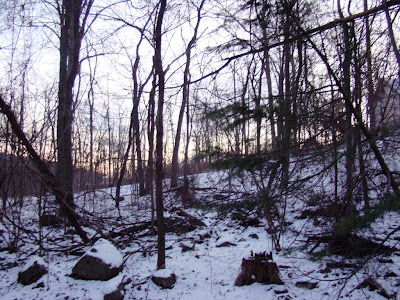 I've posted a view from this abandoned ski slope behind the cabin several times, though I usually wait until fall or perhaps for a pretty sunrise. I don't think I've ever posted the view in winter before, so it's about time. 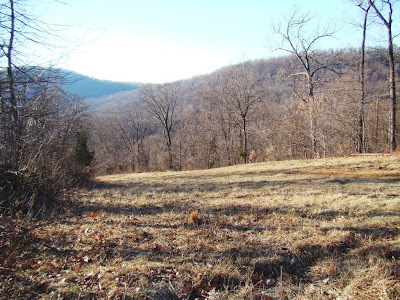 Roundtop mows this slope about once a year--just enough to keep the forest from taking it back. I make use of it to hasten my trip down into the forested valley below. I love the forest, though there's no denying that trekking through one where there's no trail takes longer. This view will likely change in a few hours when yet another ice storm covers the area. 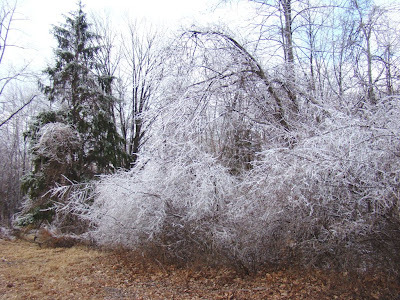 Even without this impending storm, this season's winter could savely be called the year of the ice storm. Oh, I've had plenty of ice storms in past years, but I haven't had one a week for week after week. It's gotten old, believe me. So, today seemed a good time to post a non-ice storm photo. It's likely the last time for at least several days that I will be able to do that. The lichens on this rock are amazing. So many colors, such interesting patterns. It’s even more interesting to look at them up close, with a microscope or a good hand lens. To me, they look like a coral reef, with all sorts of interesting shapes, some feathery, some hairy. Lichens can "make a living" where virtually nothing else can. They don’t have roots, so they draw water and nutrients directly from the air. When conditions are poor, they simply close up shop and wait for things to get better. Many insects live in or on them and later become food for larger animals, so lichens are a critical part of the food chain. In some places, large animals forage on the lichens in winter. Birds and small animals often collect them for nesting materials. And yet, lichens are not widely studied. Let’s face it, they’re not the most exciting thing on the planet. The don’t even grow very fast, perhaps just a millimeter or so a year. So when an area of them is wiped out, it can take decades, even centuries, for them to recolonize that area. And changes to a forest bring changes to lichens. Something like the end of the chestnut trees brought entirely new group of lichens to the forest. 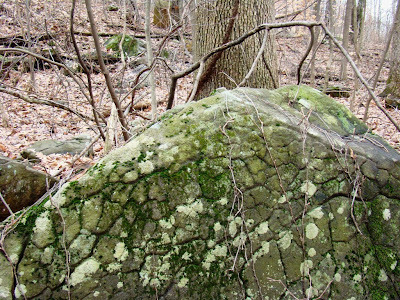 In Pennsylvania, some 30% of the identified lichens are found in two or fewer counties. Many species are thought to be in trouble, but they are so poorly studied that no one knows how much trouble they are in. They have been called the "canaries in the mine" because they are one of the first organisms to go when something is wrong in a habitat. Identifying them is almost impossible for an average person like me. For one thing, more than 15,000 species have been identified, which makes a good field guide nearly impossible. And the differences between species are often minute, requiring both testing and a microscope. So what are these lichens? Well, I can safely call them a crustose-type, which essentially means they are deeply fixed into the rock and are basically 2-dimensional. They form circular colonies and are some of the slowest growers—in that one-millimeter a year range. Other types are foliose, which means they are leaf-shaped and 3-dimensional, and fructicose, which stand upright, often with a cupped shape. They are usually found on trees, not rocks. Around my cabin, I have a lot of rocks and a lot of lichens. To me the lichens look pretty healthy, as best I can tell. Of course, my best in this one isn’t very good. But if they start to disappear, I’ll let you know.